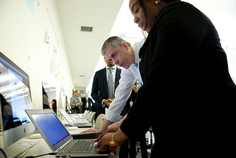 In successive events at Bates Middle School in Maryland (February 4) and Cardozo Education Campus in Washington, D.C. (February 9), Secretary Duncan talked with students, parents, teachers, and leaders about ESEA and highlighted the progress schools have made with federal support. Bates achieved a significant turnaround after becoming an arts-integrated school with assistance from a federal arts grant. Likewise, Cardozo is making major gains with the help of an Investing in Innovation (i3) grant (blog post). Building on a White House Domestic Policy Council report, the Department released new data detailing the impact of potential cuts to school districts serving high concentrations of African-American and Hispanic students as a result of H.R. 5. The data show that the House measure would provide the largest 33 districts with high concentrations of black and Hispanic students over $3 billion less in federal funding over six years. These cuts would be the result of locking in funding at sequestration levels and allowing states to move funding from the schools serving vulnerable student populations to wealthier districts. In addition, a New York Times editorial urged Congress not to “back away from important reforms,” and Secretary Duncan penned new ESEA op-eds on increasing access to preschool and expanding opportunity. On February 27, House leaders postponed a floor vote on H.R. 5. Senate education leaders are continuing work on a bipartisan bill. The FFY 2015 IDEA Part B and Part C Application Packages contain the instructions and forms States need to complete your grant applications. You must submit the completed application with supporting information on or before April 21, 2015 for Part C and May 12, 2015 for Part B. Please note that OSEP will not be mailing States hard copy packages this year. States must submit an original signed and dated copy of the Part B and Part C Applications to U.S. Department of Education, Potomac Center Plaza, Mailstop 2600, Room 4139, 550 12th Street, SW, Washington, DC 20202. However, an unofficial copy may also be sent electronically to the following mailbox: OSERS.bapp@ed.gov for PartB and OSERS.capp@ed.gov for Part C.
For your convenience, a copy of the FFY 2015 applications and supporting documents will also be available on the Internet at: http://www2.ed.gov/fund/grant/apply/osep/2015apps.html. The Call for Proposals for the 2015 Leadership Conference is now open! OSEP is soliciting proposals for Breakout sessions and the Poster session. The deadline to submit proposals is Friday, April 30, 2015 at 5:00 p.m. ET. Breakout sessions are one hour and provide opportunities for participants to share and discuss innovative approaches that are relevant to the target audience, include multiple perspectives, and lead to improved outcomes for children with disabilities. Poster sessions provide opportunities for you to share information on topics of interest with conference attendees in an open format. Toget started, click here and review the guidelines availableon the lower left-hand corner of the login page. Part B State Directors, Part C Coordinators, Preschool Coordinators, Parent Training Center Directors, Part D Technical Assistance Providers and their respective staffs are encouraged to attend. If you have questions or comments, please contact the conference staff at osep-meeting@air.org or visit www.osep-meeting.org. The Department of Education recently announced the availability of free, video-on-demand children’s television programming for thousands of students who are blind, visually impaired, deaf, or hard of hearing. Students can now view dozens of children’s and family television episodes online, featuring closed captioning and descriptions through the agency’s Accessible Television Portal Project. The portal is part of the Described and Captioned Media Program, funded by the Department, which includes video-on-demand content, provided at no cost by the major television networks and producers and distributors like Cartoon Network, PBS Kids, Scholastic Media, Sesame Workshop, and Sprout. Check out the new Blog featured this week on DISABILITY.GOV regarding the great work that Benetech is doing for individuals with disabilities! Through four programs—Global Literacy, Human Rights, the Environment and Benetech Labs—Benetech works at the forefront of building human centered software-for-good tools for individuals with disabilities, human rights activists and environmental sustainability fieldworkers. The Teach to Lead team, comprised primarily of teachers from the Department and NBPTS, developed a web site that has over 2,000 members on the virtual “Commit to Lead” community, where teachers can share their ideas and receive feedback from colleagues. The web site is also a place to access resources from 70 support organizations and read the inspiring stories of teachers who are leading change. Additionally, three teacher-led regional summits were held during the winter in Louisville, Denver, and Boston. Over 350 teachers from 38 states came alone or in teams equipped with their ideas for change. They left with more than 100 fully formed action plans to implement at home and the skills to get them done. The next step is to get more “boots on the ground.” The team is choosing two to three ideas from each summit to develop through leadership labs. The labs are opportunities for local teams to receive hands-on, targeted technical assistance from the team and supporting organizations, convene key stakeholders to discuss the status of plans and future actions, and develop approaches to integrate teacher leadership into systems and structures within local contexts. The Federal Partners in Transition (FPT) is a workgroup with representatives of several federal agencies, including the Departments of Education, Health and Human Services, and Labor, and the Social Security Administration, which was formed in 2005 to support all youth, including youth with disabilities, in successfully transitioning from school to adulthood. Working together, these agencies strive to achieve their vision: to promote the full inclusion, integration, and participation of youth and adults with disabilities in the workforce and beyond. Work to improve outcomes for youth with disabilities by 2020. I recognize the work that goes into preparing the APR each year and appreciate your efforts to get them to us by the due date. This year was particularly unique because of the new SPP, the use of GRADS360 for submission, and the inclusion of the SSIP as a new indicator. I appreciate both your patience and understanding as this was a new process for all of us. I look forward to reading more about the steps you are taking to improve results for infants, toddlers, children and youth with disabilities through your recent submissions. Secretary Arne Duncan and Deputy Assistant Secretary for Early Learning Libby Doggett stopped by Patrick Henry Elementary School in Alexandria, Virginia, to highlight the importance of early learning with a group of parents, teachers, administrators, and community leaders. The school has a preschool-through-fifth-grade program with eight preschool classes. Teachers shared their enthusiasm for the benefits that preschool brings to their classroom. “I’ve been teaching kindergarten for 19 years, and I’ve not had a classroom like this – ever.” declared Lori Shabazz, a 2014 Agnes Meyer Outstanding Teaching Award winner. “Each kindergarten teacher should get this experience -- a class that’s ready for kindergarten.” (Note: In a blog post, Latoya Smith, chair of the District of Columbia Public Schools’ Early Childhood Education Policy Council, reiterates the importance of early learning of every child. The end of third grade is the point at which children transition from learning to read to using reading skills to understand the content of all subject areas. To strengthen third-grade reading proficiency for all students, particularly students of color and students with disabilities, the My Brother’s Keeper Taskforce has established a dedicated early literacy Web site to provide educators with tools, resources, and a learning community to help them improve reading instruction in their K-3 classrooms. Technical Assistance and Dissemination To Improve Services and Results for Children With Disabilities--Model Demonstration Projects To Improve Adolescent Literacy for Students with Disabilities in Middle and High Schools, 6-12 (CDFA 84.326M), was published in the Federal Register on Wednesday, March 18, 2015. Reopening Notice for the OSERS/OSEP NIA-- Training and Information for Parents of Children with Disabilities--Parent Training and Information Centers (CFDA No. 84.328M) was published in the Federal Register on Wednesday, March 25, 2015. Data released earlier this year shows that U.S. students are graduating from high school at a record rate (press release). This week, new data shows the graduation rate for African-American and Hispanic students increased by nearly four percentage points from 2011 to 2013, outpacing the growth for all students. Moreover, the data shows the gap between white students and African-American and Hispanic students narrowed over that time (press release). To view the data, including a state-by-state breakdown, click here. Also, see the corresponding blog post with an infographic. Secretary Duncan and National Urban League President Marc Morial held a press call to discuss the importance of ensuring equity in education as part of the reauthorization of the Elementary and Secondary Education Act (ESEA). They emphasized the need to make sure school districts start with a level playing field, so that federal funds go to their intended purpose of providing additional support for the students who need it most. Failing to close the loophole allows inequity in state and local school funding, resulting in wealthier schools receiving more local money than less affluent schools.